Jennifer Bowman is a volunteer with Hero’s Bridge and the Senior Vice Commander of Warrenton VFW Post 9835. 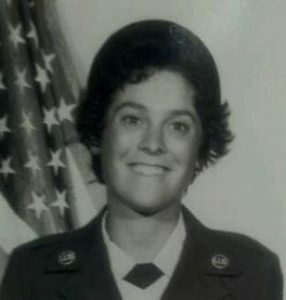 Jennifer is also a Cold War Veteran and was a Staff Sergeant US Air Force who served from 1980-1987. Plus, she graciously dedicates countless hours of service to Hero’s Bridge to help older veterans in the area. Jennifer participates in several collaborative efforts between Hero’s Bridge and Warrenton VFW Post. She attends monthly socials for veterans at the Villas at Suffield Meadows and conducts interviews to record oral history of aging veterans in the collaborative efforts of the VFW to support the Veterans History Project for the Library of Congress. Her steadfast commitment to serving veterans in the community stems from her own life experiences. She served in the U.S. Air Force (USAF) and first considered joining the military to improve her teeth — yes her teeth — since she didn’t have dental coverage at the time and really wanted clean, healthy teeth. This led her to a recruiter to discuss medical benefits and one thing led to another, but ultimately found she was very interested in a military career. Jennifer took an aptitude test and found she scored high in electronics prior to joining the USAF. Once she enlisted, the recruiter told her to wear high heels when she left for training at Lackland AFB in San Antonio, TX. “The next thing I knew I was on a plane to San Antonio in high heels! 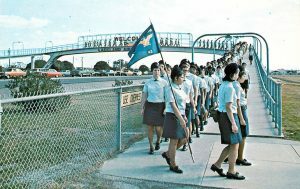 I even had to march in heels for days because uniforms were not assigned for a few days after we got there. There weren’t many female recruits, so I guess that’s why the recruiter told me to wear heels,” said Jennifer with a smile. At Lackland AFB she faced her first obstacle — basic training. She admitted it “was the most gruelling aspect” of her time there. Jennifer also shared she was not an athlete prior to joining and found the monkey bars and obstacle course very difficult to master. Although she faced this challenge head-on, she found something she excelled in and actually loved — linguistics. “At basic training, volunteers were asked to take the DLAB test which uses a language similar to Esperanto. You listen to recordings to see if you can translate what is being discussed,” she shared. Only those with an aptitude for languages were invited to participate in the Defense Language Institute and Jennifer was one of those individuals. She went on to study the Russian language intensively for 47 weeks, 6 hours per day at the Defense Language Institute, located in Monterey California. “If you passed the DLAB, you were then offered a chance to attend the course. This was the initial weeding out process… some recruits left the program through attrition during the actual linguistics training, which was very hard; there was about an 80 percent attrition rate,” she said. Jennifer is a huge fan of presidential biographies and admits she has read at least 14 biographies, not one of which stands out as her favorite. Some of the former presidents who she looks up to include: Coolidge, John Adams, and Truman. Today, Jennifer still serves the nation by assisting aging veterans through her Hero’s Bridge efforts and is supportive of other veterans through her VFW involvement. Hero’s Bridge and this country thank you for your service and appreciate all you have done and continue to do for this nation. To learn more about Jennifer read her article on the VFW’s website. Her piece is a first-hand account of one of her experiences in Berlin. Her words are descriptive and insightful. Click here if you wish read her story.